Kaka’s dear old mama, Simone Leite, has sent the gossip hounds of the world into a frothy tizz by claiming that her brood are moving to London in August, which can only mean one thing – young Ricardo is almost definitely going to rejoin Carlo Ancelotti at Chelsea. Sounds like either Kaka is indeed set to try his luck at Stamford Bridge next season or the Leites are planning to bring their roving ‘I Belong To Jesus’ Bible camp to these fair shores. With Real Madrid signing Borussia Dortmund midfielder Nuri Sahin a few days ago, it looks like Kaka’s days in the Spanish capital are numbered after failing to launch since leaving Milan. It’s also fair to suggest that Chelsea are the only London-based side that could realistically hope to match the £140,000-a-week that Kaka is currently on at the Bernabeu – though the Daily Mirror are also throwing Manchester City’s name into the mix as they are known to have flirted heavily with the Brazilian before, back in January 2009. Bearing in mind that he certainly wouldn’t come cheap, do you reckon that Chelsea (or anyone else for that matter) would be wise to take the gamble or is Kaka a busted flush? Sahin’s signing doesn’t influence Kaka’s chance of getting into the first eleven. Sahin is a central mitfielder (not a winger at all). Kaka is not a winger.. wtf? 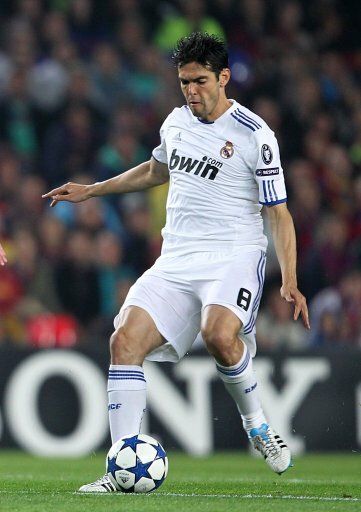 Kaka was/is the worlds best playmaker. Chelsea desperately need that atm(And wingers actually)..
He’d work with torres well, he’s all torres needs infact. But i doubt he’ll fit in with the old boys(Anelka, Drogba, Malouda). As much I as want him to be Chelsea’s winger he won’t as long as Mourinho is Real’s manager. All he wants is Frank Lampard. Kaka gets injured and goes out off form but Lampard gets injured once every ten years and comes back to 6 goals in 8 games. why is kaka’a mama announcing this? and the fact that they’ll be “preaching the word of god”? kinda embarrassed for kaka…and please, don’t “preach” anything! perhaps he’s off to Loftus Road? Have you watched ANY of dortmund’s games this season (and the few seasons before)?